As a component of EMHR's current National Park Service project through the Chesapeake Bay Gateways & Watertrails Network, EMHR worked with a local group of citizens and community leaders of the Tunkhannock area to design a River Town community information sign. This sign, installed at the inviting green space area of the Dietrich Theater at the intersection of Route 6 and Route 29 in downtown Tunkhannock, serves as a key asset to interpretation, education and promotion concerning Tunkhannock’s finest historic and cultural assets. The concept and basic design of the River Town sign was developed through the Susquehanna Greenway Partnership as part of a larger corridor-wide River Towns initiative. The signs are intended for application in Key Susquehanna River towns to inspire exploration. According to the Susquehanna Greenway Partnership, our Commonwealth has a strong foundation and collection of unique small river towns that are connected by the Susquehanna River and set amidst pastoral landscapes of rolling farmlands and forested ridges. From historic downtowns and heritage festivals to riverfront parks and river races and paddling, there is much to discover. Encouraging discovery and exploration of the many heritage and recreational sites in and around Susquehanna River Towns is the motivation of our Tunkhannock River Town sign. “Live, Learn, Explore” is the theme we use to inspire residents and visitors to spend more time in this wonderful community and become more connected to the special qualities it has to offer. We also hope the sign inspires more individuals to be advocates for our natural and cultural treasures. 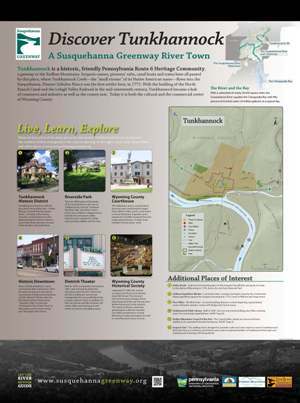 EMHR facilitated the development of the sign under the guidance of Susquehanna Greenway Partnership staff and in cooperation with officials of Tunkhannock Borough. Sign content comes from research and careful consideration by a local team featuring Wyoming County Historical Society volunteer and EMHR board member, Sarah Carr, Dietrich Theater leaders Margie Young and Erica Rogler, Endless Mountains Visitors Bureau executive director, Jean Ruhf, Bob Kulow, representatives from the Tunkhannock Business Association and Diane Secor of Volunteer Strong. Funding for the project comes from National Park Service through the Chesapeake Bay Gateways & Watertrails Network, Pennsylvania Department of Conservation and Natural Resources, Wyoming County Room Tax Program, and Procter & Gamble Paper Company. The sign’s location is provided by the generosity of Wyoming County Cultural Center. The dedication of the new River Town sign took place on Friday, June 22nd,at the Dietrich Theater green space to include the paddlers on our Susquehanna River Sojourn coinciding with their planned stop in Tunkhannock. The Wyoming County Press Examiner covered the event and shared this photograph. Thanks to all who contributed to the sign’s design, content, installation and celebration!